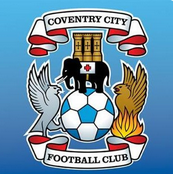 Discussion in 'Coventry City General Chat' started by Nick, Aug 11, 2013. Bloody hell, fair turnout this. I'd predicted no more than 7 000, so it looks like it will exceed my expectations. Do we know which turnstiles will be open? I felt #1 priority was to get more than at Northampton, not much of a contest there. To get more than the capacity of Northampton would be fantastic. Also, once you factor in people who would have gone but can't for whatever reason, or those who won't go to this but would have gone to watch CCFC had we been at the Ricoh today, there's a large number of people that the club have successfully managed to alienate. Any news on the other team? From Wolves FPA -Mel Eves (player-manager) plus Lee Naylor ; Jon Purdie and Tony Dinning; from Aston Villa FPA - Derek Dudley; Ian King; Des Little; David Norton and John Pearson; fromLeicester City & W.B.A. Phil Gilchrist alongside former Northampton Town stars Coventry kid Terry Angus; and Bedworth born Dean Thomas as well as Stuart Storey (Hinckley Utd Manager and ex Birmingham City). The Midlands XI will also be assisted by two National Hunt Jockeys, Charlie Poste and Jodie Mumfordso somebody will be for the high jump! I've just bought my 3 tickets. Block 20 on the halfway line. Does anybody know who the old boy is selling the tickets? Is he a former player? We have limited resources we have made arrangements to open a very small number ofest cash turnstiles on the day for latecomers – but if you leave it late you may miss the build up to the fun and games and the actual kick-off by a ‘mystery’ guest. DEANO any word on who the mystery guest could be? Never heard of any of them! Is the ticket office open until 12.30pm? I'm just about to head up there now. A weatherman, 8 small parts and a widow twanky. This is going to be a very special day in our history. Get yourself to the Ricoh today to show you still care about football in Coventry. It could also show new owners there is a fanbase in Coventry. It will also put some much needed £ into local and cancer charity. There is every reason to go! Right, I'm here... Anyone know where i can get my hands on one of the sky blue kcic wristbands? Gotta give props to the people who have maintained the pitch, looks beautiful! Just sat down. Pitch looks the best I've seen it. What a pity it's not going to get properly used.